Any dish that still remains popular nearly 200 years after it’s creation is going to be a damn good meal. 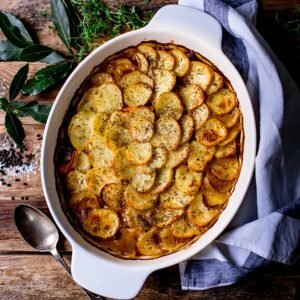 I grew up in the North of England, so this Traditional Lancashire Hotpot is one of my staple dinners! I’m going to start today with a tiny history lesson (no sleeping at the back!!). I grew up in what used to be Lancashire (the boundaries have changed over time), so it’d be wrong of me not to give you a bit of the background of this dish. 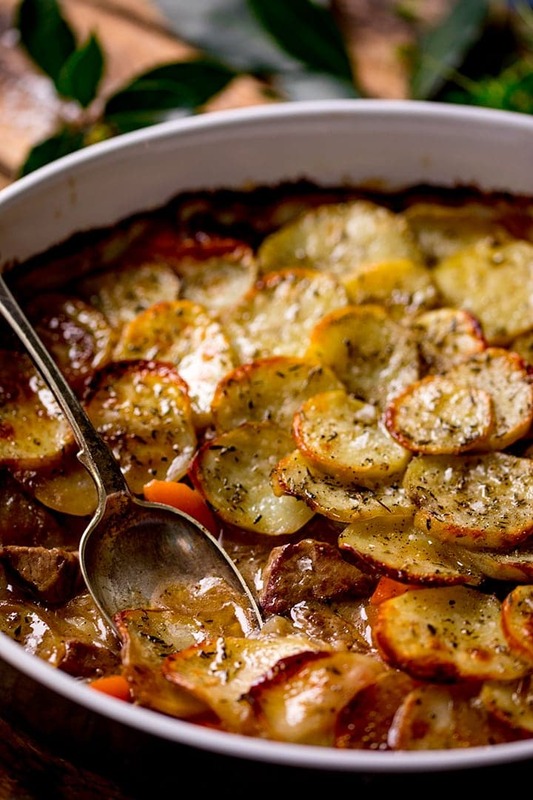 Lancashire Hotpot is thought to have originated during the cotton industry in the 19th century. It’s a simple meal that would have been left to cook slowly all day, ready for the hungry cotton workers at the end of their shift. It was probably more likely to have contained mutton in those days, and would invariably have been left to cook with a lamb bone still in the dish – for added flavour. The meat was often bulked out more with oysters – which were very cheap in the 19th century. Not sure I fancy recreating the oyster version (only tried oysters once and it was not a pleasent experience). There are a few variations out there: some made without stock, some with carrots, some with oysters and/or kidneys. However, nearly every recipe does agree that this is a dish made with lamb, butter, onions and layers of potatoes. I’ve eaten and made this absolutely loads of times. You can’t beat the flavours of that juicy lamb, especially with a nice spoonful of mint sauce. My version has carrots in – I love the way they absorb all the flavour, plus it means I only need to serve one other side of veg with it. 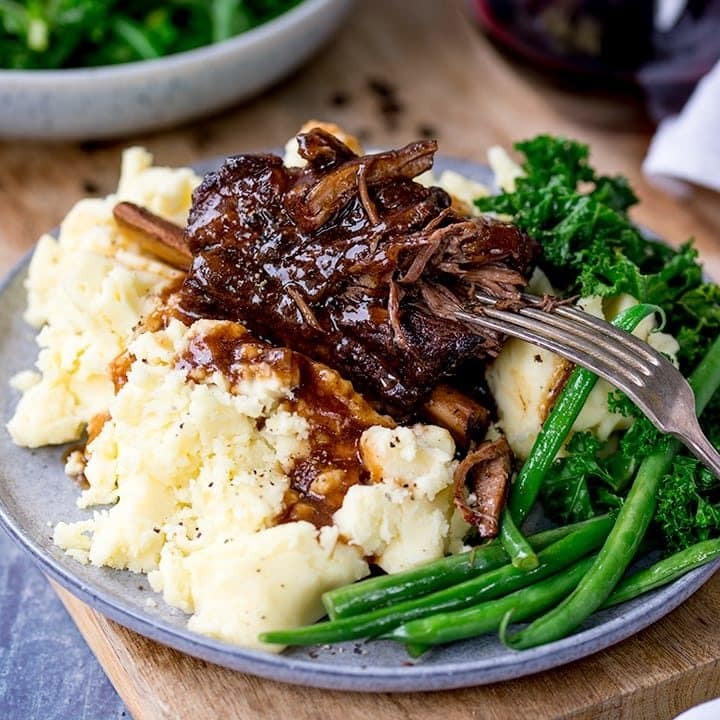 It also has a meaty gravy that’s been thickened slightly due to the addition of flour in the early stages of the recipe. We start by frying off some diced lamb in a hot pan. Remove the lamb, then soften the onions in the same pan and add the lamb back in. Stir in flour, then pour in stock. Add a couple of bay leaves, a good sprinkling of salt and pepper and a good splash of Worcestershire sauce. Cover and place in the oven for 30 minutes. Transfer the pan contents to a casserole dish and stir in chopped carrots. Then top with thinly slices potatoes. Brush on a little melted butter and sprinkle on some dried thyme. Cover and place in the oven for 1 hour. Remove the lid, knock up the heat and cook for a further 30 minutes until those potatoes are lovely and golden. 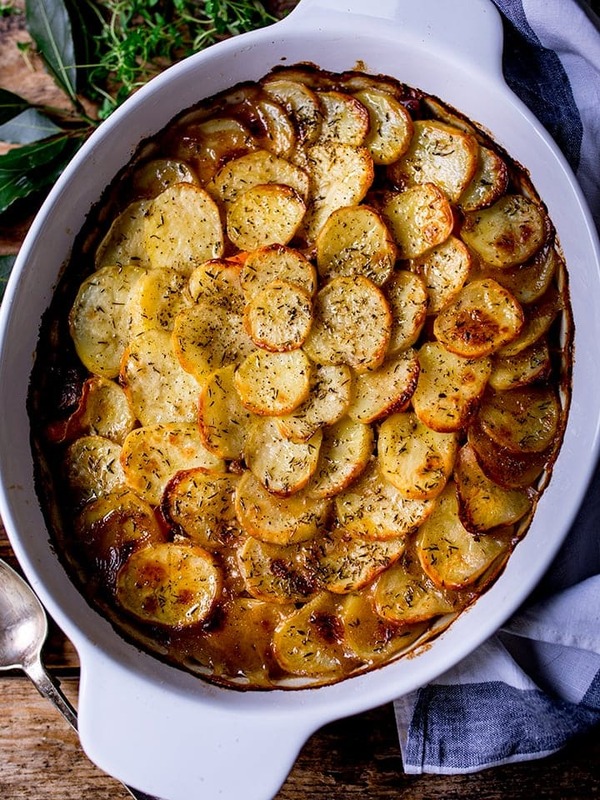 The potatoes are sliced thinly and cover the whole dish, overlapping each other – which results in the potatoes on top being lovely and crisp, whilst the parts of the potatoes underneath are soft and tender. You can use a mandolin to cut the potatoes if you like. 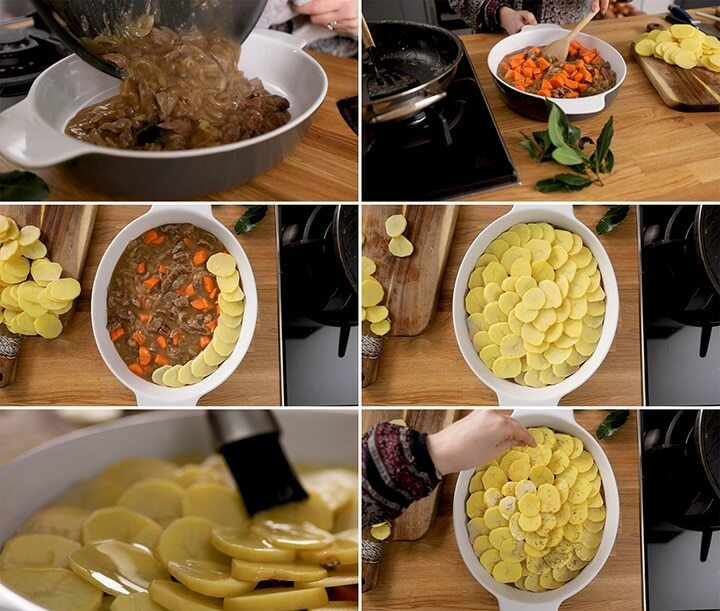 I have got one, but I still usually cut the potatoes for this using a sharp knife – since it’s only a few potatoes. Mandolins are great for dauphinoise and coleslaw, but I only use mine when I’m cutting large quantities of veg. Even using the guard, the blade on that thing gives me the heeby jeebies. 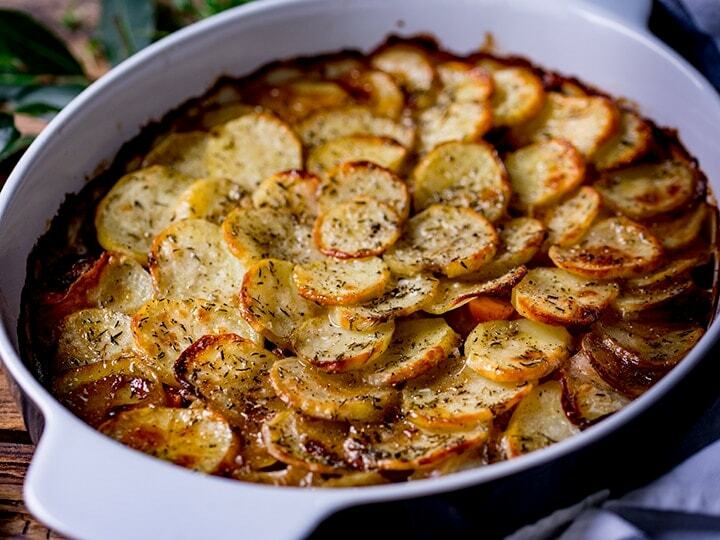 You want the potatoes to be about 2-3mm thick to ensure they’re cooked and crisp on top. You can cut them thicker if you like, just make sure you cook the dish for longer. Once you’ve got this meal in the oven, your house will smell so good. Everyone will be waiting at the table with forks at the ready. Make sure you have some spoons too – you wouldn’t want to miss out on any of that delicious gravy. Melt the butter and vegetable oil in a medium sized casserole or sauce pan and fry the lamb pan until lightly browned all over (about 3-4 minutes). 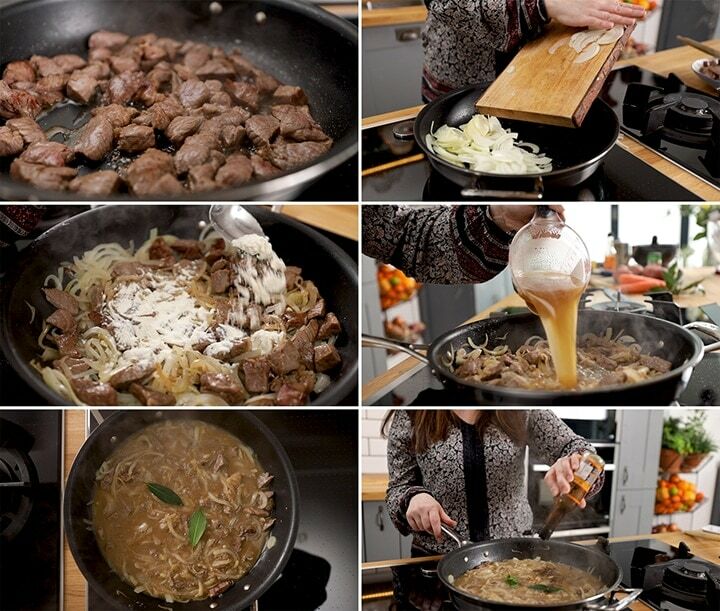 Spoon the lamb into a bowl, then add the onions to the pan and cook for 3-4 minutes, stirring regularly, until soft. Add the lamb back in, then stir in the flour, cooking for a minute. Add in the stock, bay leaves, salt, pepper and Worcestershire sauce. Give everything a stir, bring to a gently bubble. Then place a lid on it and cook in the oven for 30 minutes. After 30 minutes, stir in the carrots. At this point, you can transfer the contents of the pan to a casserole or pie dish if you wish (I moved mine to a 25cm diameter pie dish). Top with the sliced potatoes. Start from the outside, and layer the potatoes, moving towards the centre. Brush the top of the potatoes with the melted butter and sprinkle on the dried thyme. Cover with a lid or foil and place back in the oven for 1 hour. After an hour, turn the oven up to 200c/400f and remove the lid. Cook for a further 30 minutes until the potatoes are browned and crisp on top. Take out of the oven, and leave to rest for 5 minutes or so (it will be very hot), then serve with some green veg. You're looking for a cut of lamb with a little fat. 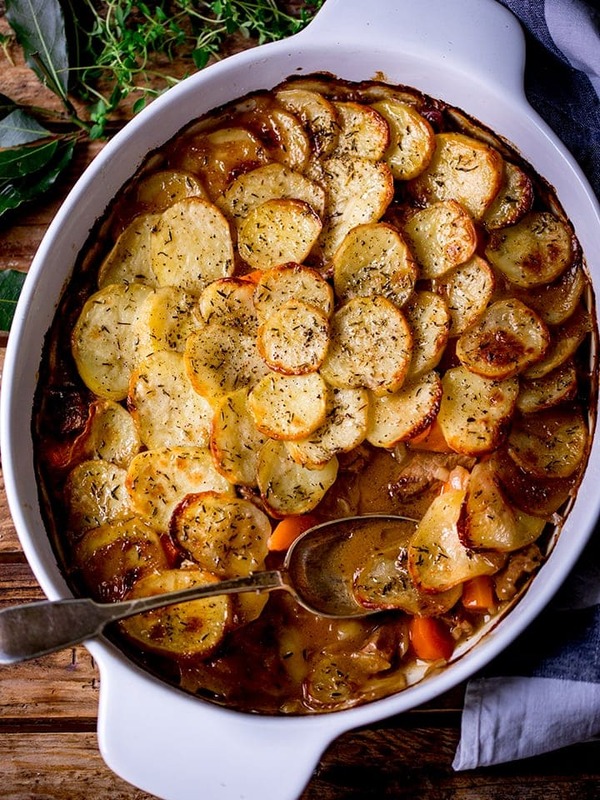 Fat (not grisle) really helps to give this hotpot lots of lovely flavour. Diced lamb neck is perfect, as it has little streaks of flat running through it. Diced lamb shoulder or leg will also work. If you want to use ready-diced lamb, that's fine too - just make sure it's a little fatty. Use gluten free stock cubes in your stock and gluten free plain (all-purpose) flour. Also check your Worcestershire sauce brand and use a gluten free version if necessary. If is contains malt vinegar, it's not gluten free. Biona do a good gluten free version. Cook the Lancashire hotpot right up until the end of stage 5 (where it's been in the oven for an hour with the lid/foil on). Then remove from the oven, cool, cover and refrigerate for a day or two. Take out of the refrigerator a couple of hours before you want to heat it - to take the chill off. Then place in the oven at 170C/325F for 20 minutes with the lid/foil on. Then turn up the oven to 200C/400F, take the lid/foil off and cook for a further 30 minutes, until the potatoes are browned and crisp and the hotpot is piping hot throughout. 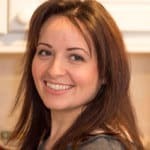 Can I freeze Lancashire hotpot? Yes, cook the Lancashire hotpot right up until the end of stage 5 (where it's been in the oven for an hour with the lid/foil on). Then remove from the oven, cool, cover and freeze. Defrost in the refrigerator, then take out of the refrigerator a couple of hours before you want to heat it - to take the chill off. Then place in the oven at 170C/325F for 20 minutes with the lid/foil on. Then turn up the oven to 200C/400F, take the lid/foil off and cook for a further 30 minutes, until the potatoes are browned and crisp and the hotpot is piping hot throughout. If you're cooking for a crowd, you can double this recipe. Double all of the ingredients and an extra tablespoon of flour at step 3. You'll need to use a very large casserole dish or baking tin, so that the thickness of the casserole remains the same as with the smaller version. Cook for an extra 30 minutes at step 5. The rest of the cooking time should be approximately the same. 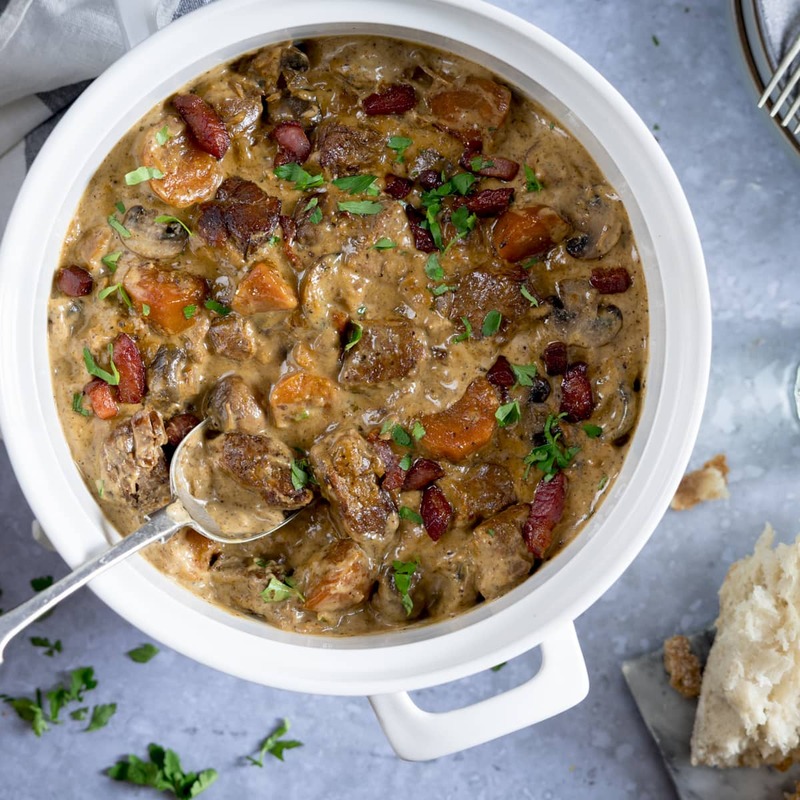 Can I make it in the slow cooker? You can make it in the slow cooker, but you won't get that all important crispy potato topping - the potato will stay soft. If you wanted to do that anyway, brown the lamb in a frying pan and transfer to the slow cooker. Then soften the onion, stir in the flour, stock, bay leaves, salt, pepper and carrots. Bring to the boil and transfer to the slow cooker. Stir together and layer the potatoes on top. Brush on the butter and sprinkle on the thyme, then cook on low for 5-6 hours, until the lamb and potatoes are tender. This post was first published in January 2015. Updated in April 2019 with new photos, recipe video and extra hints and tips. At last a recipe that doesn’t use cups as a measurement, well done, It’s one of my personal annoyances when virtually all internet recipes use cups. Just to pander to lazy Americans who can use scales. Made this for dinner tonight after a week of below -30° weather here in Michigan. Thankfully I didn’t need leftovers for lunch tomorrow. We ate all of it, and I can’t wait to make it again. Gorgeous traditional hot pot, this is one of my ultimate comfort dishes in chilly weather. Think it’s time I remade that one for the blog, terrible photo!! We used to have something like this for dinner too – my Mum is from Lancashire. And I am with you on the Mandolin. Mine scares the pants off me! I put my hands over my eyes whenever I see a chef on TV using one! My Mum used to cobble together something very similar on deep, dark winter nights! This looks like the perfect foil for cold winds and rain on the rooftop! Loved the history lesson too. I was reading somewhere that the Victorian era was the peak of oyster consumption. Apparently they would eat up to 124 million oysters per year in London! 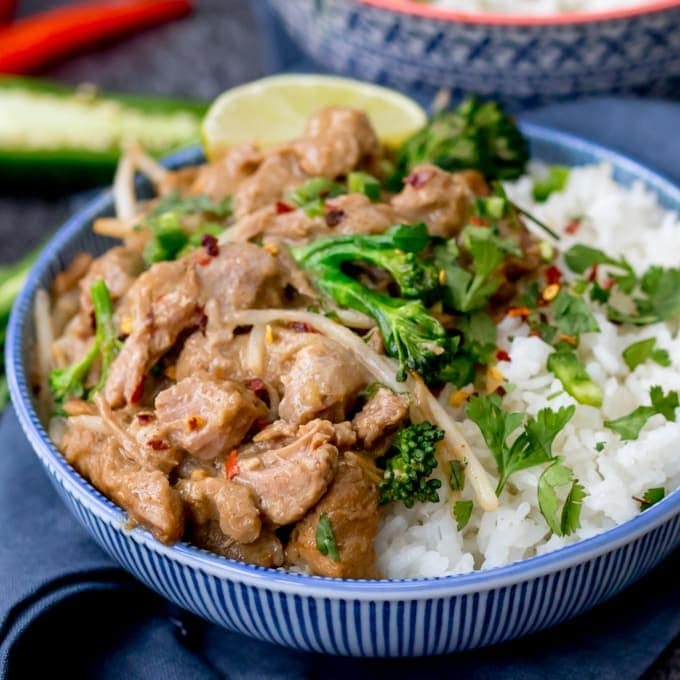 Anyhoo – great recipe as always Nicky! Wow really? and now they’re the height of sophisticated eating. It’s funny how these things change! I’ve made shepherd’s pie with leftover leg of lamb but I think this pot pie will be even more satisfying. Ooh that’s shepherds pie sounds fab though. 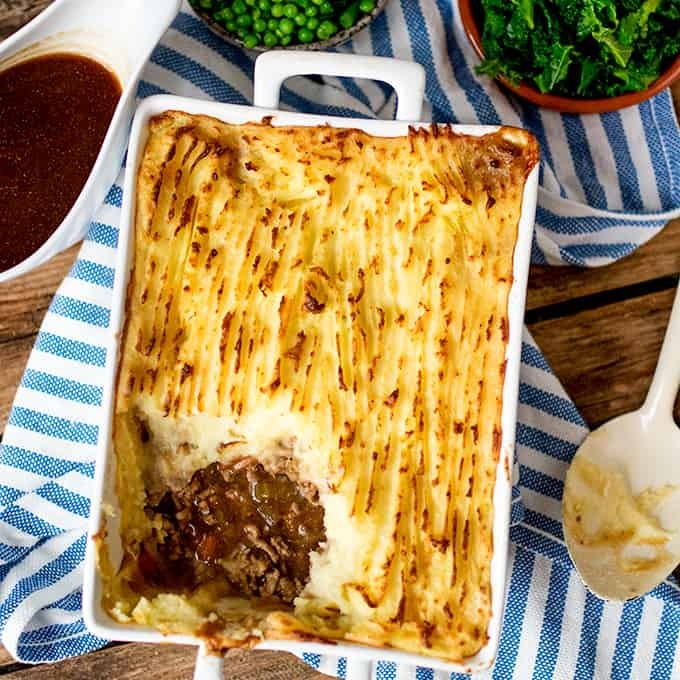 I normally just make the quick cottage pie version with minced beef, but I haven’t done a proper lamb one in ages! Delicious!!! I made something like this a couple of weeks ago and it was a disappointment – will definitely try it with your recipe soon and let you know. Thanks Mandi, I’d love to know how you got on. What a beautiful dish Nicky! I love hearing these stories and am still awake!